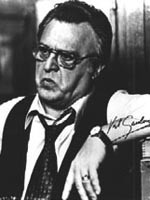 Vincent Gardenia was nominated twice for Best Supporting Actor Oscars for Bang the Drum Slowly and Moonstruck. 09/14/1976 0518 Journey to Jerusalem A man longs to be young again so he can live his life differently. A strange woman says she can make it happen. He actually spelled his name "Gardenia" and was one of the talented character actors ever to be on the screen. He is missed, just like all the amazing actors of his generation - Jack Warden, J.T. Walsh, Darren McGavin, and so many others. RIP, Vincent Gardenia. He actually spelled his name "Gardenia" and was one of the most talented character actors ever to be on the screen. He is missed, just like all the amazing actors of his generation - Jack Warden, J.T. Walsh, Darren McGavin, and so many others. RIP, Vincent Gardenia. Vincent Gardenia (born Vincenzo Scognamiglio; January 7, 1920 – December 9, 1992) was an Italian-American stage, film, and television actor. He was nominated twice for the Academy Award for Best Supporting Actor, first, for Bang the Drum Slowly (1973) and again for Moonstruck (1987). He also portrayed Det. Frank Ochoa in Death Wish (1974) and its 1982 sequel, as well as Mr. Mushnik in the musical film adaptation of Little Shop of Horrors (1986). Vincent played a small role in the film The House on 92nd Street and bit parts in other films, including Cop Hater and A View From the Bridge. His first English-speaking role was in 1955, as a pirate in the Broadway play In April Once. The following year, at age 36, he appeared as Piggy in his Off-Broadway debut in The Man with the Golden Arm. He described his role in the film Little Murders as a "turning point".He won Obie Awards in 1960 and 1969. A life member of The Actors Studio, He won a Tony Award for Best Featured Actor in a Play in 1972 for his performance in The Prisoner of Second Avenue, opposite Peter Falk. In 1979, he was nominated for Best Actor in a Musical for his performance in Ballroom. Gardenia's other notable feature films include Murder Inc. (1960), The Hustler (1961), The Front Page (1974), Greased Lightning (1977) and Heaven Can Wait (1978). On television, he won the 1990 Emmy Award for his performance in Age-Old Friends, with Hume Cronyn. Among his best-remembered TV roles is his portrayal of Archie Bunker's neighbor Frank Lorenzo on All in the Family (1973–74) and as J. Edgar Hoover in the miniseries Kennedy (1983). He also played in an episode of Voyage To The Bottom Of The Sea titled "Escape From Venice." Watched Moon Struck again a couple weeks ago. Hes He’s good in it and in every thing I’ve seen him in. I remember his death. He died while staying at a hotel in Philadelphia while he was there for a role he was performing.